Our u-value calculator is intended for use with bespoke timber framed windows and doors. There is a one of payment for this service. You do not need to be a member of our site and you can use the service as little or as often as you like. You are not restricted to products from one supplier. To provide that u-value we need the information as specified below. Submit that information using the form on this page. All measurements are to be specified in m.
L1 and W1 are the dimensions of the Frame. L2 and W2 are dimensions of first glass panel, if there are more than one glass panel continue filling in the boxes. 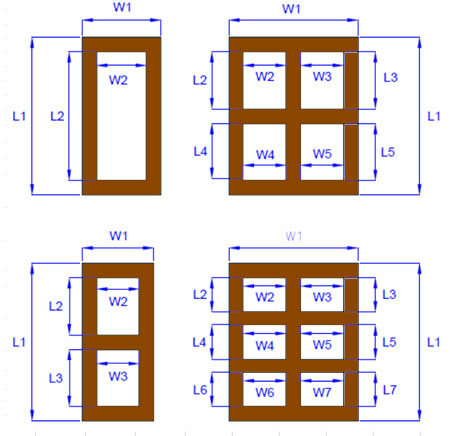 L3 and W3 are for the second panel and so on. The glass types specified are manufactured by “Saint Gobain”. Double and Triple glazing. For Example 4mm / Air / 4mm means a double glazed unit with 4mm thick glass, then Air then another 4mm thick glass. Note: If your glass is supplied by any other manufacturer please specify the details in the appropriate box alongwith the u-value of that glass, which you can obtain from your supplier. This is the space between the glass panels. In the previous example it is “Air”, and that space could be between 6mm and 20mm. We will assume foam. However if something else is being used please feel free to specify what it is.. The normal spacer used between the glass panels is made of Aluminium, however the “Swiss Spacer” is more efficient, and will lower the overall u-value. There are other types of spacers available and these should be listed here. Our U Value Calculator is designed to give accurate u-values for windows and doors. A Detailed certificate with a unique serial number, which should be acceptable to building control, will be issued in PDF format on receipt of full payment. The cost of this service is £35 per certificate.